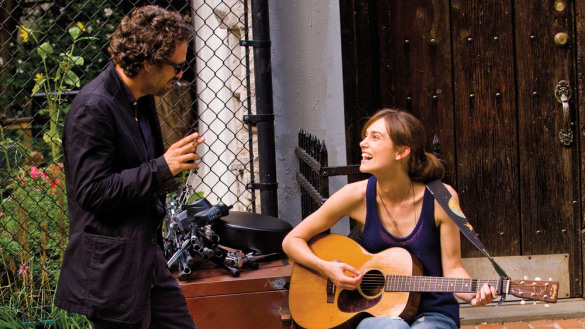 Like a great song, Begin Again is all about the build-up. It’s a long road of meh, though, until the electrifying, invigorating, chill-inducing third act, which almost makes up for a choppy beginning and sometimes dull middle bit. Keira Knightley stars as Greta, a Londoner in New York with her beau, next-big-thing-in-music Dave Kohl (a surprising Adam Levine). She writes songs with him, sometimes for him, and they’re madly in love until she hears one of his new tunes and deduces that it’s about another woman. Disgruntled, she sings about loneliness at a dingy club later that night, where Dan (Mark Ruffalo, phenomenal as usual), drunk as a skunk, imagines Greta being backed by a pianist, violinist, cellist and drummer. It’s magic, he thinks and hopes. Posted by The Cafe Phenomenon on July 18, 2014 in Uncategorized. "The Cafe Phenomenon" refers to a situation, specifically in a cafe, where you are sitting with a friend and engaging in conversation with them, but you suddenly find yourself unable to listen because the background noise of the cafe distracts you from what they are saying (the background noise could be any thing: the gossip at the next table for example). It happens that, from time to time, in certain contexts the background noise is stronger and more defined than our personal and private one on one conversations. Our blog, made up of a group of friends from Concordia's journalism program, can serve as the background noise penetrating the intimate discussions of our virtual cafe dwellers (hopefully adding insight, relevant coverage, and interesting ideas). Or it can be the friend with whom you are deep in conversation. This, our dear readers, we leave to you.